5847 17Probe 12 Pfg. 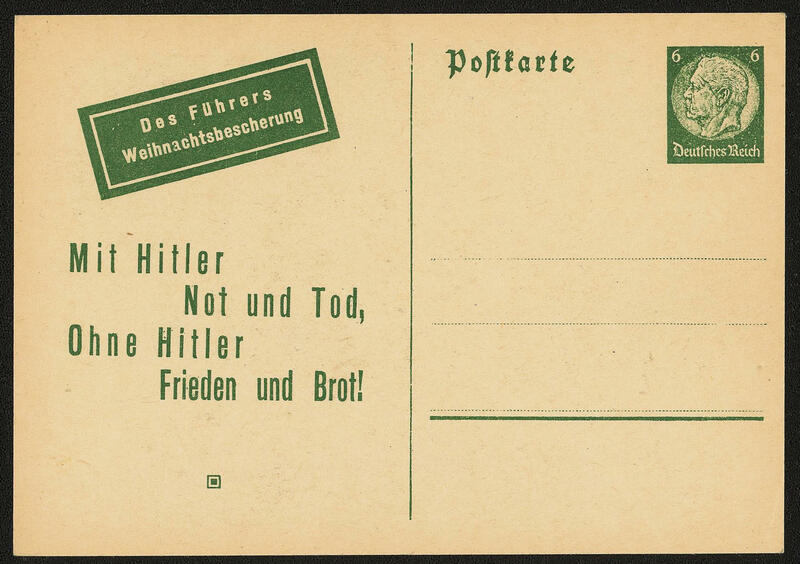 Hitler 1944, American Propaganda forgery for Germany, Hitler with skull with inscription \"gone REICH\", spectacular proof in black on reddish brown ungummed cardboard paper, unperforated with two-sided wide margin. One of the great rarities of this area, from which very few examples have become known. 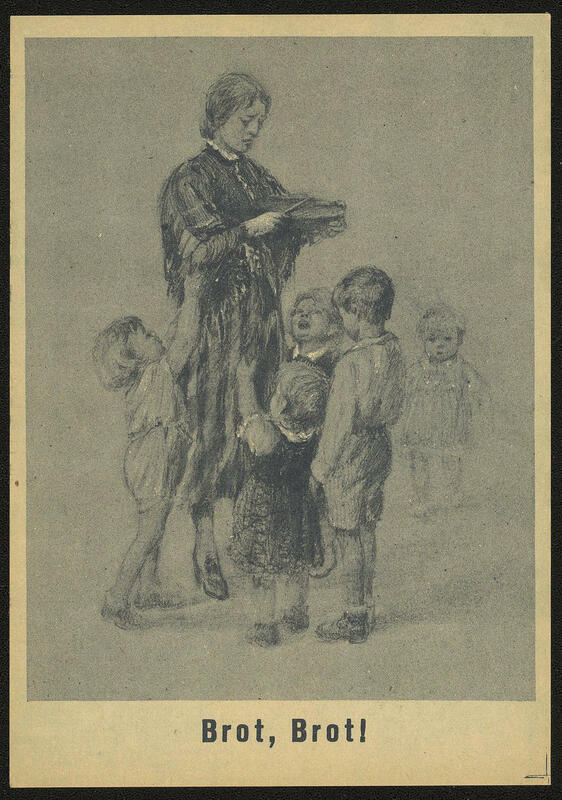 In the Michel special catalogue up to now unknown! Expertized Ludin, photo expertize \"the quality is perfect\" Pieles BPP. 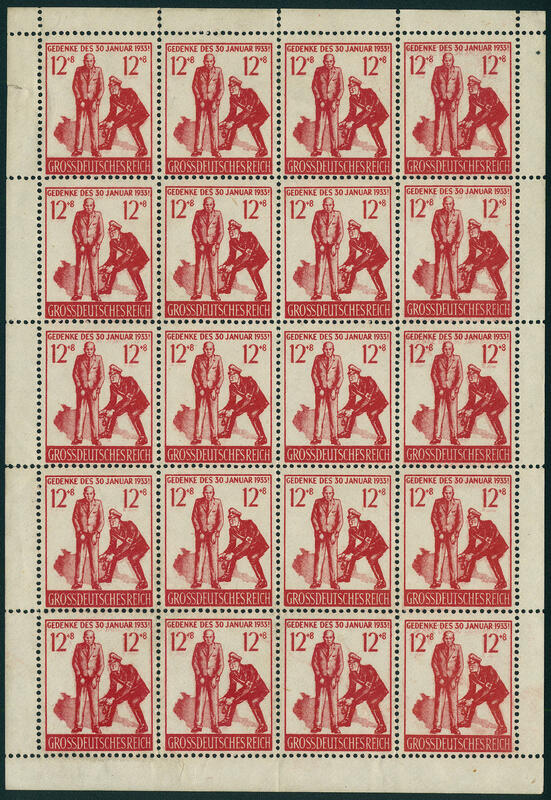 5848 ✉ 19II \"Habitat in the east\", Soviet Russian propaganda counterfeiting card for Germany with imprinted postage stamp 6 Pfg. 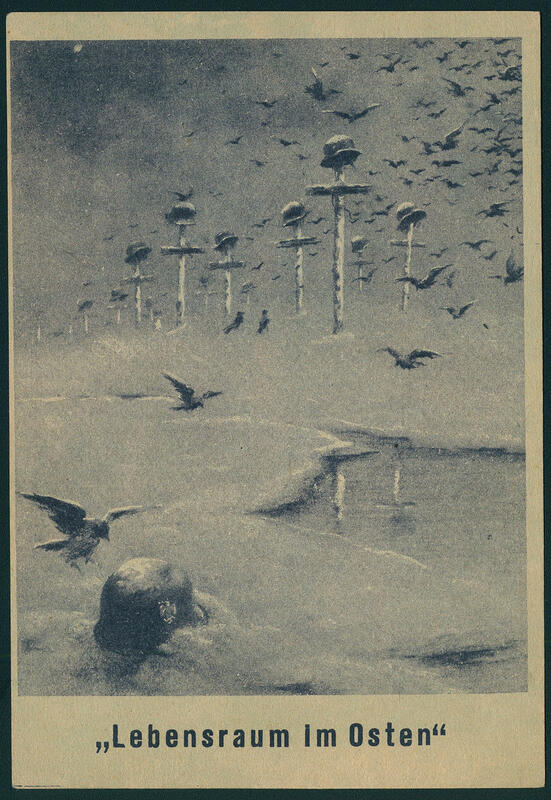 Hindenburg and illustration from grave crosses with German steel helmets and so on, in perfect condition unused. 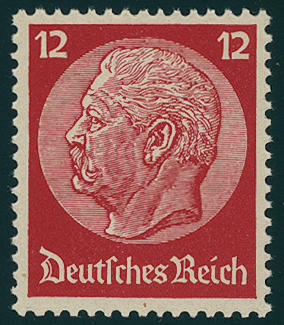 An extraordinarily scarce, hardly once offered issue! 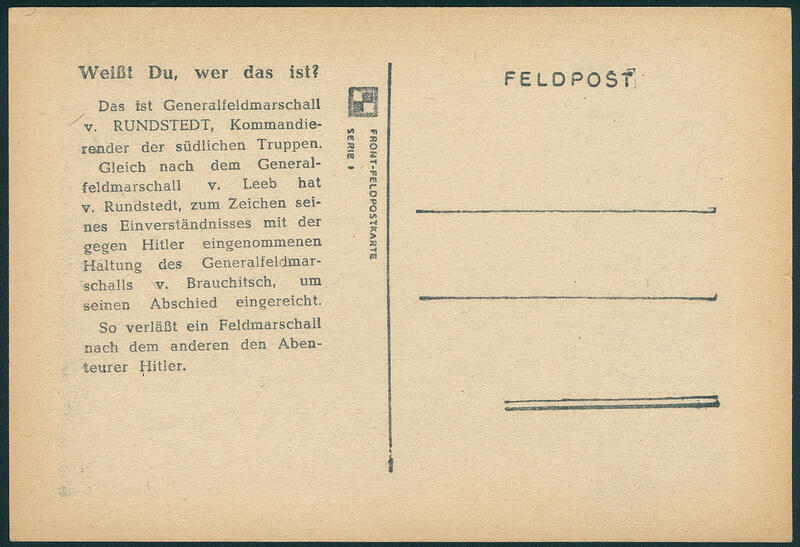 5849 ✉ 19V Soviet Russian forgery for Germany, propaganda card \"bread, bread! 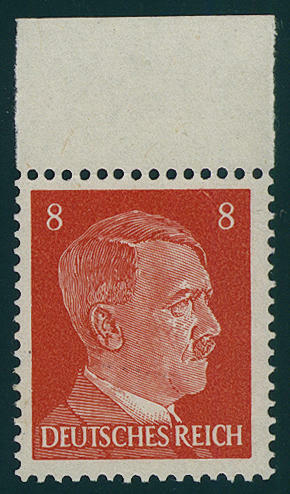 \" with illustration hunger the children, postage stamp impression 6 Pfg. 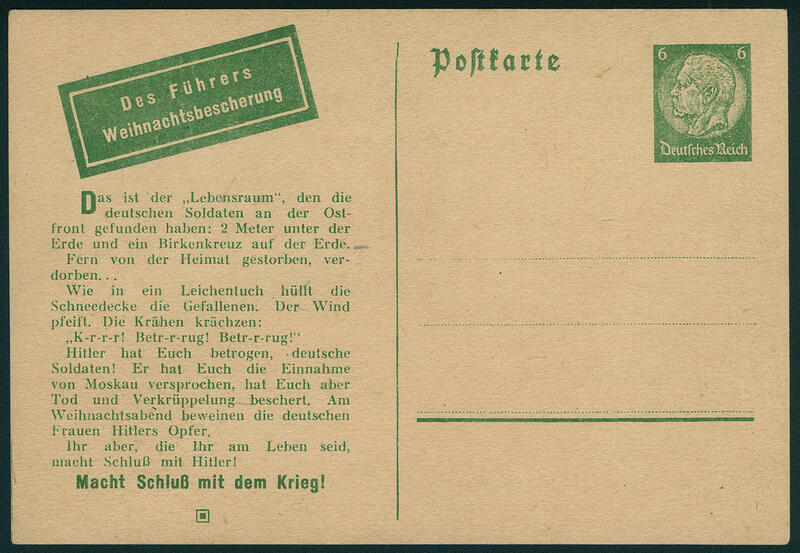 Hindenburg and imprinted label \"of the Leader Christmas presents\", as well \"with HITLER adversity and Death, without HITLER peace! \", fresh colors and in perfect condition unused. An extraordinarily scarce and sought card in perfect condition. Photo expertize \"genuine and immaculate\" Zirath. 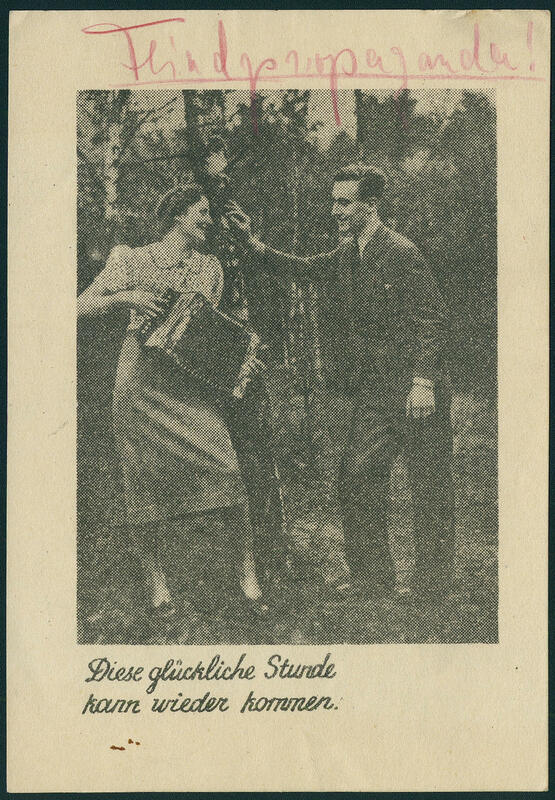 5850 ✉ 20I Soviet Russian propaganda counterfeiting card for Germany, \"these happy hour can again come\" with illustration \"accordionist and a male in the WALD\" unused, a slight edge compression and minimal Rust trace are absolutely insignificant, with scarce handwritten notation \"FEINPROPAGANDA\" in red colour. This enemy propaganda notation must from finder one such card compelling on those finds written become. There are very few examples in this kind have been preserved, because these mainly destroyed were. A rarity of this area! Photo expertize Pieles BPP. 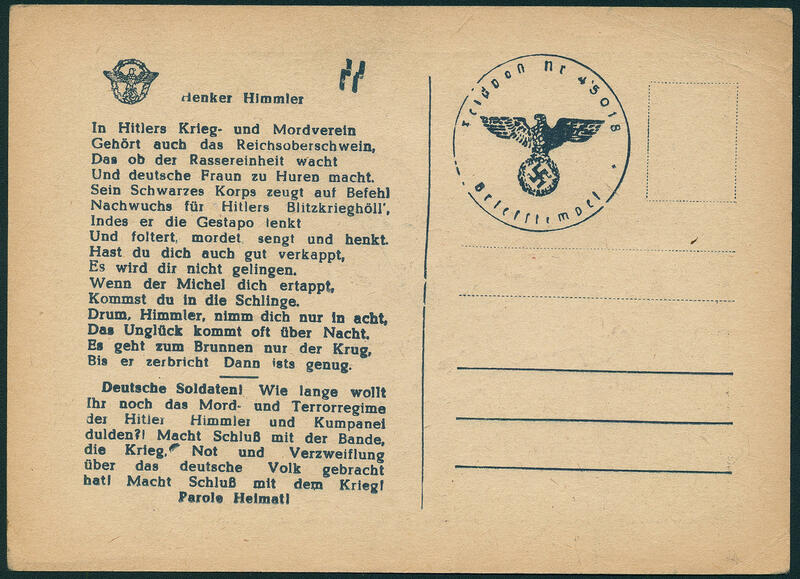 5851 ✉ 21AII \"HIMMLER, HITLERS bloodhound\", Soviet Russian propaganda counterfeiting card for Germany with poem \"hangmen HIMMLER\" and imprinted army postal service letter cancel, minimal corner creases, in wide above average good condition. A very scarce, nearly always missing card! 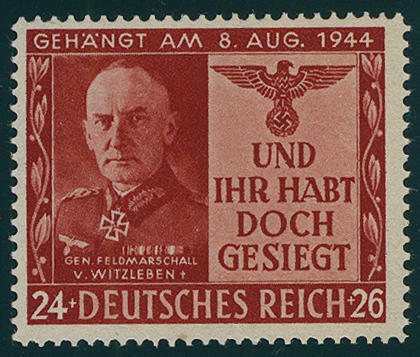 5852 ✉ 21DVI Soviet Russian forgery for Germany, the very scarce war propaganda counterfeiting card \"whitens you who that is?\" with illustration of the General Field Marshall from Rundstedt, fresh colors and in perfect condition unused. A rarity of this area in excellent quality! Photo expertize \"the condition is perfect\" Pieles BPP. 5854 22 12 Pfg. 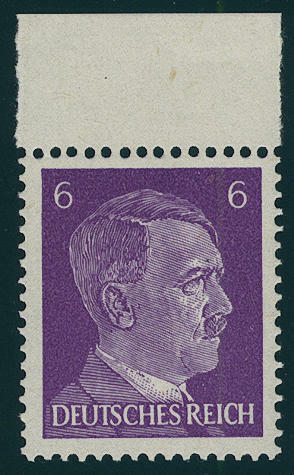 Hindenburg, fresh colors and very well perforated, in perfect condition mint never hinged, without any signs. 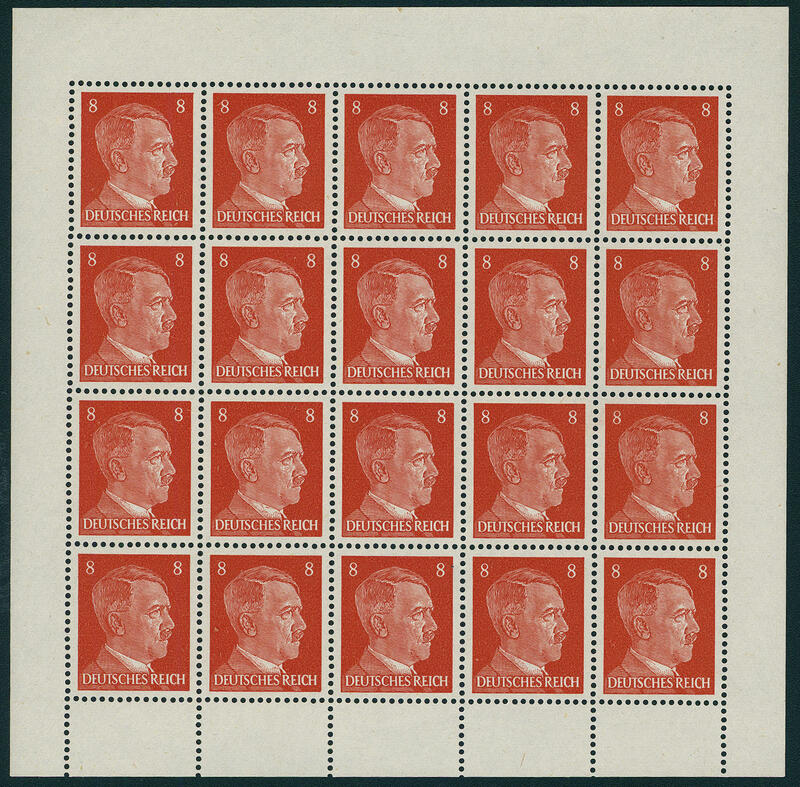 An outstanding quality of this rare and sought-after issue! Photo expertize \"the quality is perfect\" Pieles BPP. 5855 23/26A 3-8 Pfg. 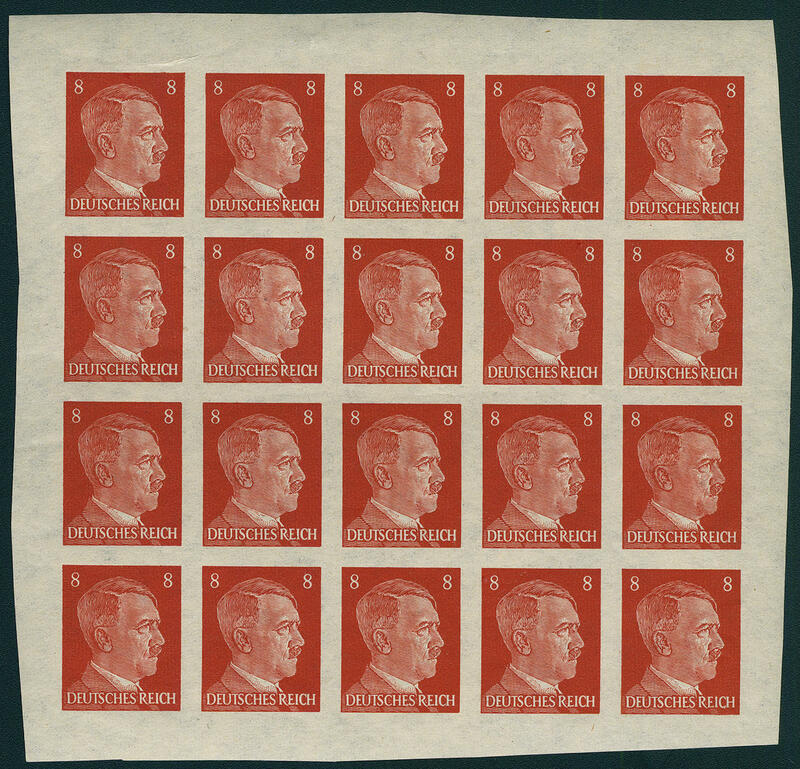 Hitler, British war propaganda forgeries for Germany, the complete set from four values in complete sheet to always 20 values, fresh colors, unfolded, in perfect condition mint never hinged, without any signs. Complete sheet sets are only still few have been preserved and especially in this excellent quality extremely rare! Photo certificates \"the quality is perfect\" Pieles BPP. 5856 23/26Ay 3-8 Pfg. 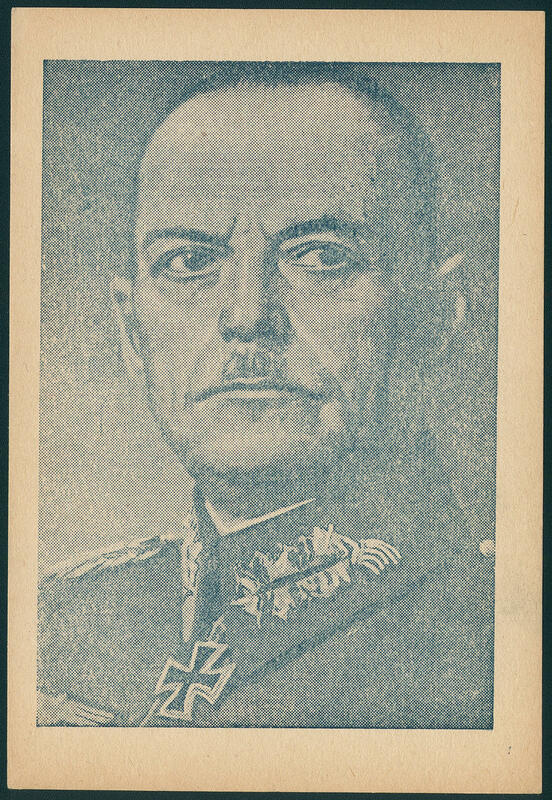 Hitler, all fours propaganda forgeries from upper margin, fresh colors and very well perforated, in perfect condition mint never hinged photo expertize \"the quality is perfect\" Pieles BPP. 5857 23BAbart The new discovery: 3 Pfg. 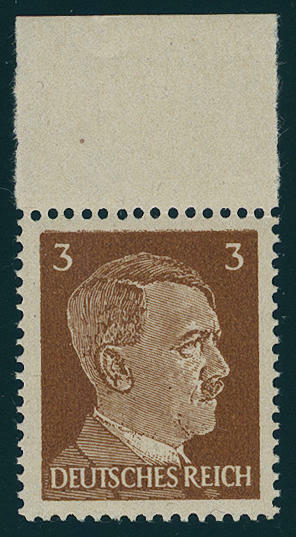 Hitler, British Propaganda forgery for Germany, unperforated on up to now entirely unknown yellowish paper in the block of ten with on three sides margin, fresh colors, in perfect condition mint never hinged (only the margin of sheet above is unused, only as a matter of form mentions). Also further single pieces hereof are up to now unknown. By this block of ten it concerns an at assuredly grenzender probability an unique piece. One of the most spectacular rarities of this area! Expertized Ludin BPP, photo expertize \"the quality is perfect\" Pieles BPP. 5858 23PU 3 Pfg. 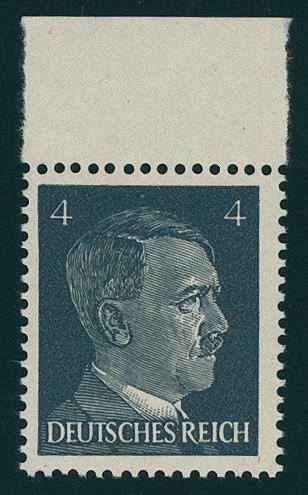 Hitler, unperforated proof in different colour, fresh colors and large margins all around, in perfect condition mint never hinged (a small paper creasely is manufactured). A spectacular rarity of this area, like they also in the Michel special catalogue up to now unknown is. Photo expertize Pieles BPP. 5859 25BAbart The new discovery: 6 Pfg. 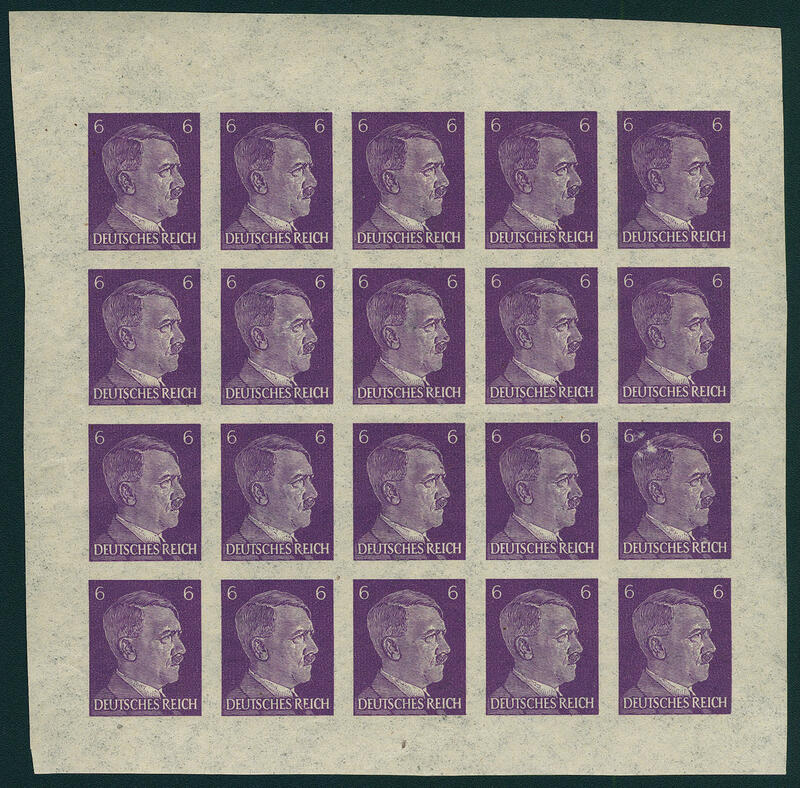 Hitler, British Propaganda forgery for Germany, unperforated on up to now unknown thinly, yellowish paper in the complete sheet of 20 each values mint never hinged, small faults are insignificant, with on all sides margin. 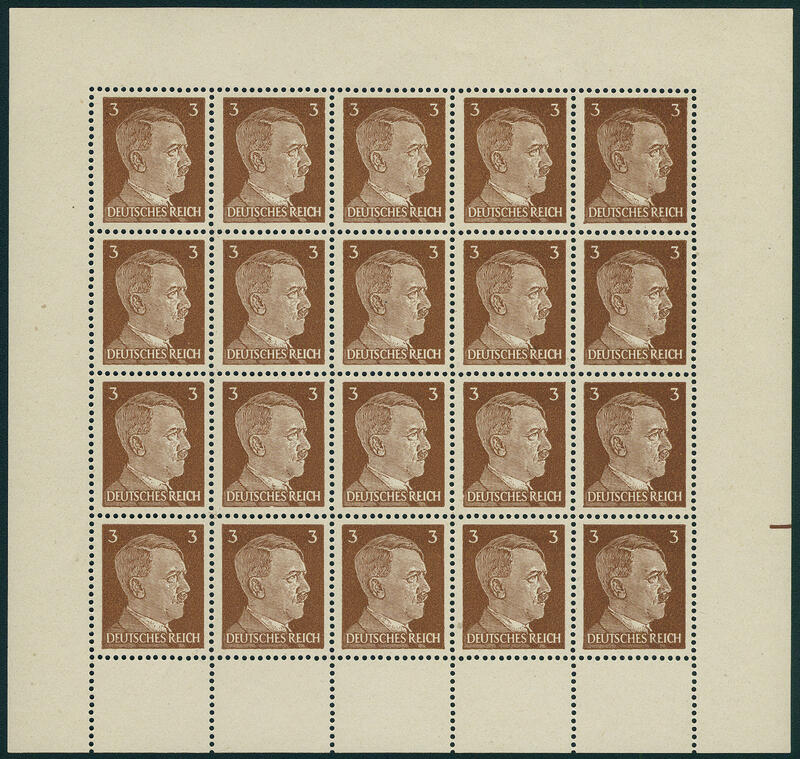 Already normal unperforated values become hardly ever offered. With this paper this propaganda forgery was completely unknown so far. 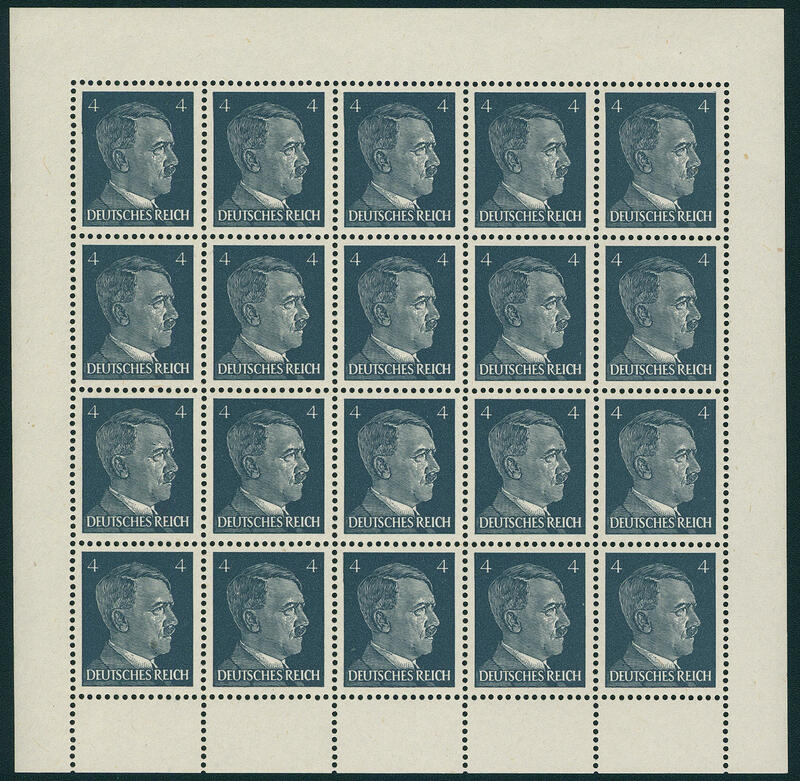 This miniature sheet is with a probability bordering on certainty unique and thus represents one of the greatest treasures of this area. Photo expertize Pieles BPP. 5860 26BAbart The new discovery: 8 Pfg. 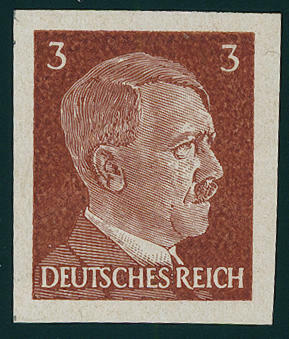 Hitler, British counterfeit for Germany, unperforated on up to now perfect unknown thinly, yellowish paper in the complete sheet of 20 each values with on all sides margin fresh colors, mint never hinged, negligible faults are insignificant and to of our Opinion mostly manufactured. 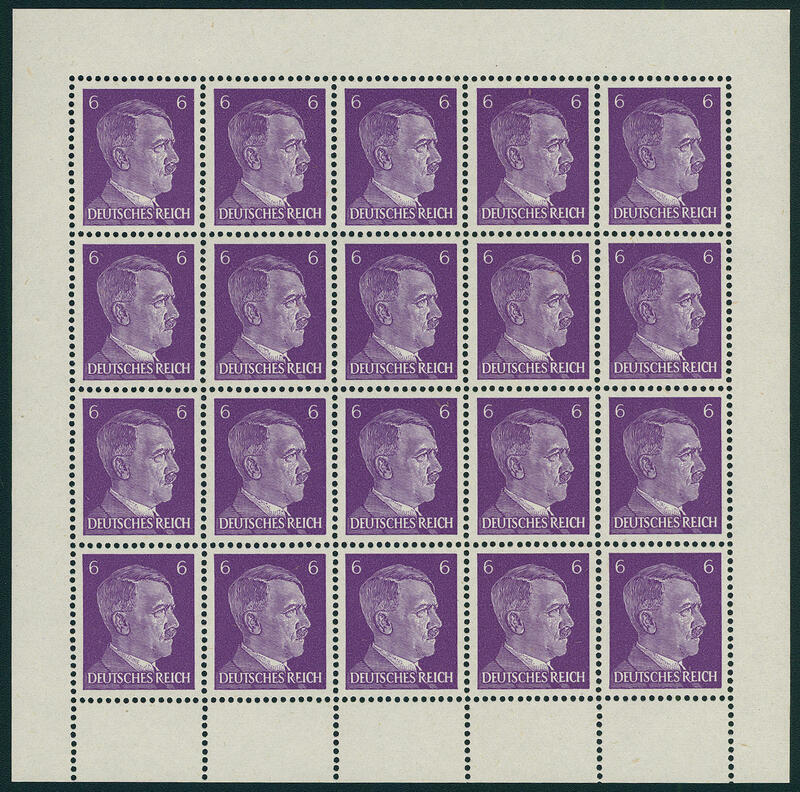 Already normal imperforated values are hardly ever offered. In this type of paper are also single pieces up to now perfect unknown. It is a matter by this sheet with a probability bordering on certainty an unique piece and thus one of the most spectacular rarities of this area! Photo expertize Pieles BPP. 5861 28I 6 Pfg. 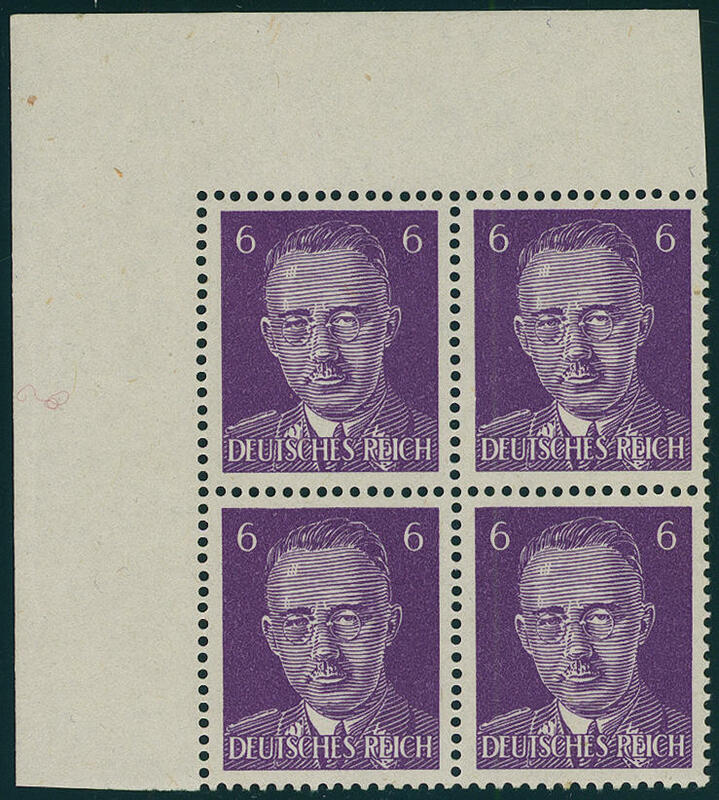 Heinrich Himmler, British Propaganda forgery for Germany, the scarce \"wide hatched face\", magnificent block of four from the left upper corner, fresh colors and very well perforated, unfolded, in perfect condition mint never hinged, without any signs. An outstanding quality this rarity for the highest standards! Photo expertize \"the quality is perfect\" Pieles BPP. 5862 28I 6 Pfg. 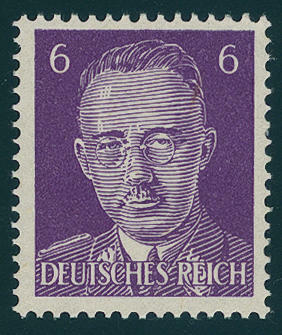 Heinrich Himmler, wide hatched face, the scarce type, wonderful fresh colors and in perfect condition mint never hinged, without any signs. A rarity of this area with very small edition in utterly perfect condition. Photo expertize Pieles BPP. 5863 29 24 Pfg. 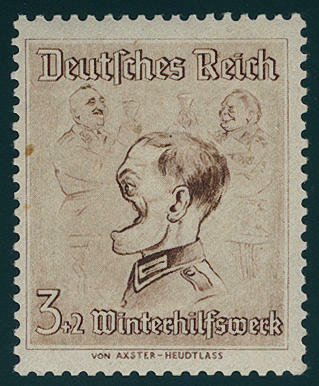 General field marshal Erwin from Joke life 1944, British Propaganda forgery for Germany, fresh colors and very well perforated mint never hinged, gum slightly shaded. A sought issue! Photo expertize Pieles BPP. 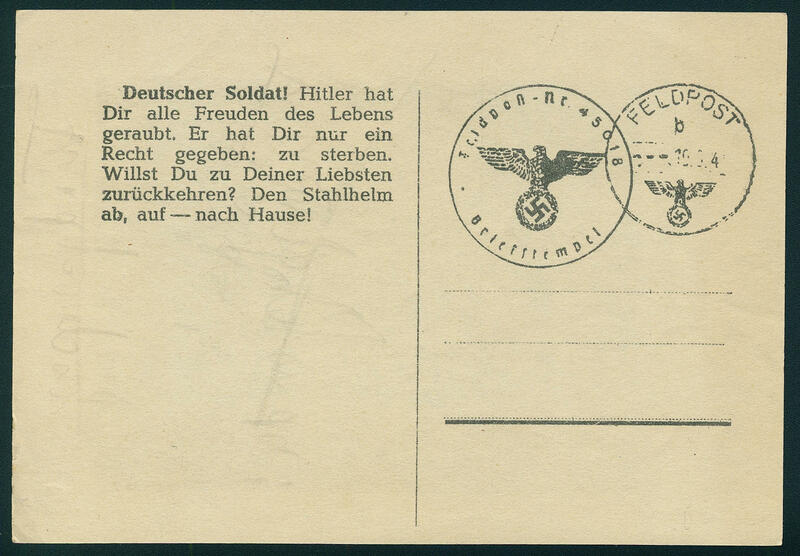 5864 30/31 Winter help work 1944, both propaganda forgeries as stamp booklet pane with margin, fresh colors, unfolded and in perfect condition mint never hinged without any signs. A very scarce and sought issue. Photo expertize \"the quality is perfect\" Pieles BPP. 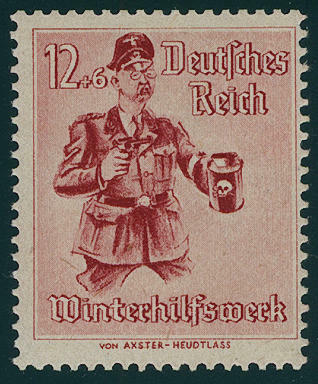 5865 30/31 Winter help work 1944, serviceman with shot away face and Heinrich Himmler treasures for the winter help, both propaganda forgeries fresh colors and very well perforated, nearly mint never hinged with in each case one minimal nearly irrelevant adherence trace. Photo expertize Pieles BPP. 5866 32A 12 Pfg. 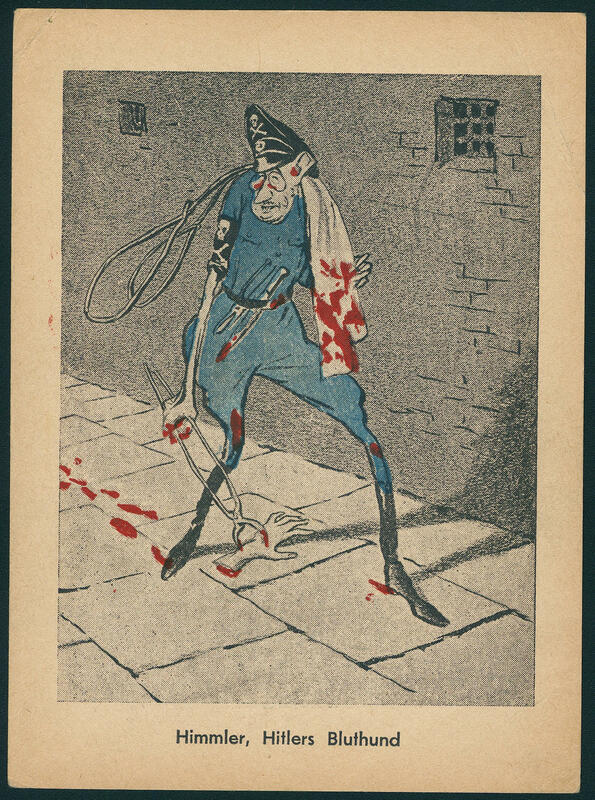 Himmler puts captivated civilians shackles at, British war Propaganda forgery for Germany, complete original sheet of 20 each values fresh colors with all margins, without gum, perforation partly prefolded, as well here and there separated, the minimal paper curls are absolutely insignificant and become only as a matter of form mentions. 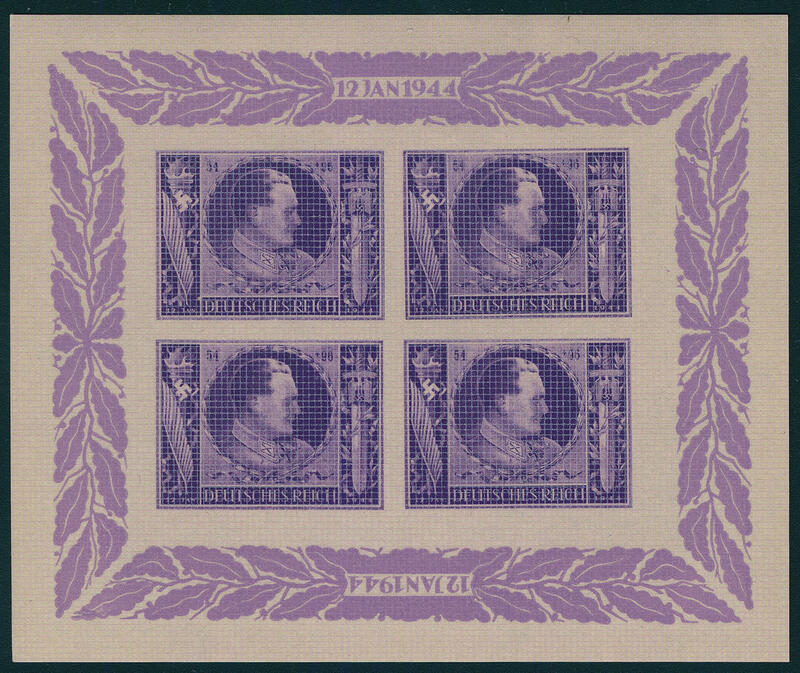 A spectacular unit of this rare issue! Photo expertize Pieles.